Our 6 Week Dr. Seuss Birthday Reading Challenge is about inspiring children to read as many Dr. Seuss words as they can for his birthday! Each week , for 6 weeks building up to March 2nd (Dr. Seuss's birthday), we are offering a FREE Downloadable Activity sheet in conjunction with the book of the week. Children can read the book, complete the activity sheet and log their progress in their VERY OWN Word Journal. All the details are listed below. 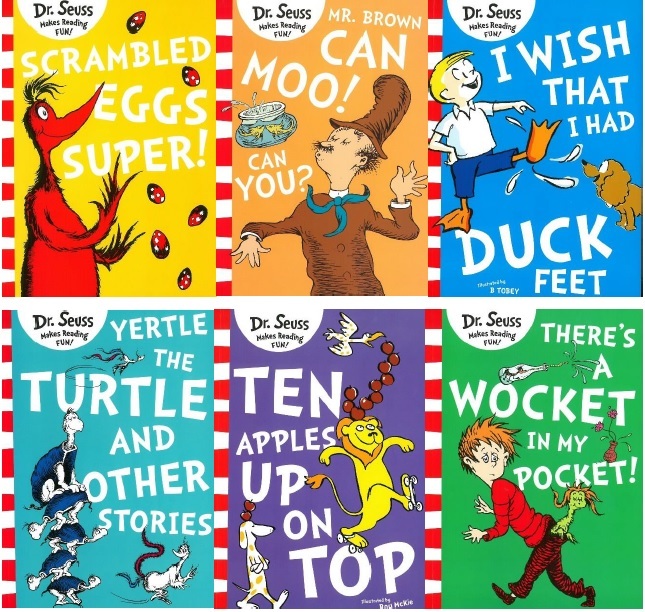 All the books you will need for our 6 Week Dr. Seuss Birthday Reading Challenge, conveniently packaged and ready to use with our FREE Weekly Activity Sheets! The Dr. Seuss Word journal can be used as a fun way to have a challenge of your own and track your words throughout the summer when you aren't near a computer! Each page represents a week in the challenge and features a calendar where you can write your words or books read each day! Week Two: Mr. Brown Can Moo! Can You? : What Is Making That Sound?